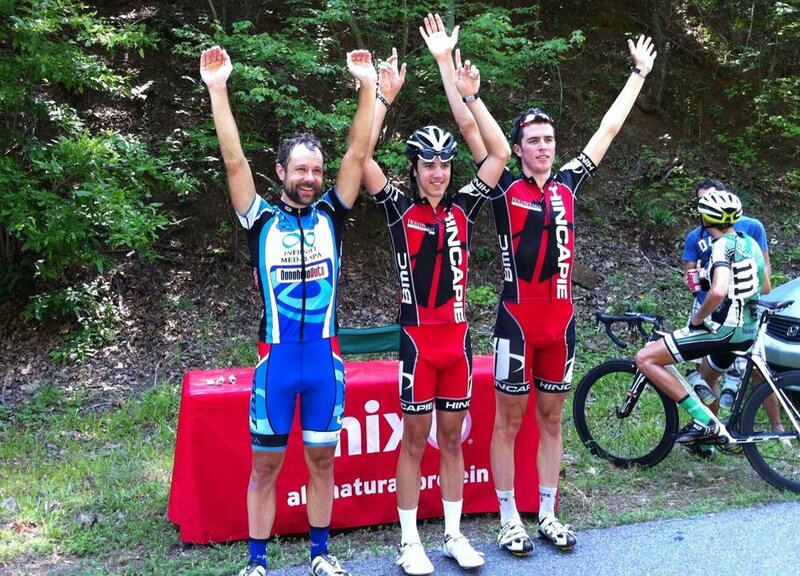 Hats off to the Hincapie Devo guys who took 1-2 in the Tour of Atlanta Burnt Mountain road race today. I squeezed onto the podium for third. The race started down a steep hill, and a group of eight of us carried a lot of momentum down it into a breakaway within a few hundred meters of the start. I didn’t even realize we had a gap until Brendan Sullivan (Irondata) said “let’s make them work for it” a few miles later as the main field was chasing back on. Meanwhile, Michael Stone (Hincapie Development) and a Globalbike rider had gone off the front of our group. Mike was flying, and he dropped his breakmate at some point during the first lap after they had gained over 3 minutes on our group. Brendan and I took turns pushing the pace on the Burnt Mountain climb and descent. After the descent, a couple more riders joined in the chase. Eventually we got a rotation of four of us at the front of the group chasing, but with a constantly rolling course (STEEP 10-15% rollers), it was hard to keep a good rhythm. Towards the beginning of the second lap, we caught the Globalbike rider who had been in the break, but Mike still had 3 minutes on our group. Globalbike joined in our chase efforts, and our pace picked up leading into the second trip up the Burnt Mountain climb. I set the pace for the first part of the climb, followed by Brendan in the middle section, and then as we approached the scenic overlook Michael Lanham (Globalbike) attacked our group. I was able to hold his wheel, but just barely. By the first false summit of the climb, there was just four of us together. After the first short downhill and leading into the second small summit climb, there were five of us. Then by the start of the descent, there was about seven or eight of us together. By the start of the descent, I had drained my second water bottle, but I still had a few ounces of water left in the neutral bottle I had gotten at the end of the first lap. So on one of the straighter sections of the descent, I sat up to unscrew one of the bottles and dump in the rest of the neutral bottle. In doing so, I came off the group as they descended and had to chase a little bit during the descent. I felt this was good for the legs though to keep them moving and keep the lactic acid from building up with only a few miles from the bottom of the descent to the finish of the race. I caught on by the bottom, and I expected a salvo of attacks from the Hincapie and Globalbike teams who each had two riders in our group. Instead, Mike went off solo, and the Hincapie riders decided to bring him back slowly. There was an immediate counter attack, but the group was right on it and everything was together going into the last steep hill before the finish. Again, Mike set a fast pace on the climb. Then about halfway up, one of the Hincapie riders attacked but didn’t make it very far with Mike bringing him back and leading the rest of the way up the climb. Towards the top with less than 500 meters to go to the finish (including a downhill), Mike attacked again to start the sprint. He got a bit of a gap, but Edison Turner (Hincapie Devo) was able to grab his wheel with me just behind. Then with 200 meters to go, Edison and I both came around Mike and then I immediately tried to come around Edison – but he gave it that extra little kick and I couldn’t come around so I finished 3rd with Brendan grabbing 4th and Mike 5th. This entry was posted in Racing and tagged photos, podium, strava, videos on May 31, 2011 by kartoone. Tour of Atlanta, Burnt Mountain road race tomorrow. We drove in from Birmingham today, and I headed out for a loop of the course while the kids went swimming with Kristine at the hotel pool. Even though the race starts early, it’s going to be a hot, humid race if it’s anything like my pre-ride today. The entire course has steep rollers leading to the one big climb up Burnt Mountain. We’re doing three laps of the course, so I’m thinking total elevation gain could be close to 10,000′. Check out the pictures that I took during the ride … hover over each one for a caption. This entry was posted in Racing, Training and tagged photos on May 29, 2011 by kartoone.